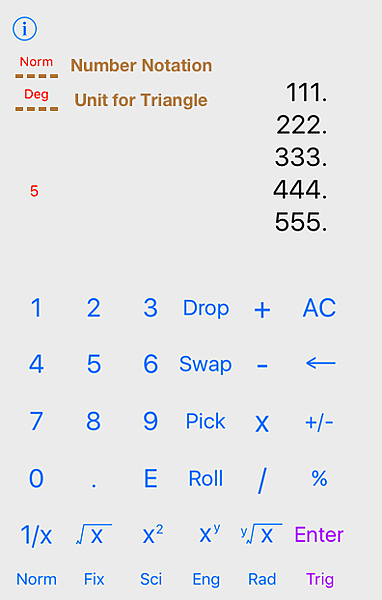 This is the Instruction of the App "Stack_Calculator" what I developped for Apple iPhone series. I use this for my daily number calculation work and love it. 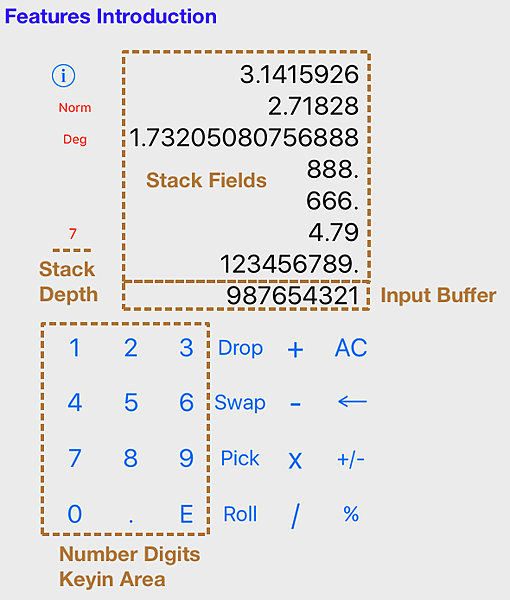 Stack Calculator is a type of RPN (Reverse Polish Notation) calculator based on a 256 depth float-point number stack. A number stack equipped in a calculator is actually a more nature and much efficient way to manipulate number-crunching job and interface between machine and human. This calculator is designed as this concept. By the help of the stack, calculation becomes a very interesting RPN form. much simple and easy way without extra annoying parenthesis for calculations. Also, all numbers automatically remain on stack during calculation, no extra store/recall commands are needed. Real numbers currently exist in stack, only showed top 7 (or 10) here, not editable, deeper numbers will not be displayed. The field to keyin and edit the number currently you inputed before you press 'Enter' button pushing it into stack. To show how many the numbers currently exist in stack. Backspace key to eliminate last digit if you have any typing mistake. Change the sign of the number in the input buffer. Put the number from input buffer into the top of stack. It actually equals to divide by 100 at the first number on top of stack. Swap the order of two numbers on the top of stack. Duplicate a specific number inside stack onto the top of stack. After press this button, calculator goes into "pick up" mode, then you have to tap further on the 'stack field' where the target number on the display to perform the action. Roll a specific number inside stack out to the top of stack. After press this button, calculator goes into "roll out" mode, then you have to tap further on the 'stack field' where the target number on the display to perform the action. By combination of these stack operation commands, you can freely manipulate any numbers in stack displayed on screen. A book costs $70 and on sale, 15% off, how much is it? How much you have saved? 1 + ( 2 + 3 + 71 x ( 7 + 9 x 4 ) - 15 ) + 5 x 17 = ? How much total payment they have to pay? If they want to share in average for each people, how much payment each one has to pay? When there exists only one number on stack (or input buffer), if you tap [+], [-], [x], [/], one of these 4 buttons, calculator will enter into continuous operation mode. A 'K' mark will appear on display to indicate calculator is in this mode. When in this mode, the initial number on stack will be memorized, then if you continuously tap [Enter] button, this number will continuously be calculated with the number on top of the stack by the same operator again and again. If calculator is in 'Continuous operation mode', tap any key besides [Enter] will leave this mode. 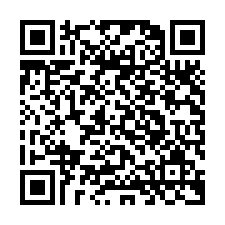 1 [+] <-- goes into Continuous operation mode with 'add' operation, constant number is 1, 'K' mark appears on display. TIP: You can use this as a counter to count anything by your iPhone! 2 [x] <-- goes into Continuous operation mode with 'multiply' operation, constant number is 2, 'K' mark appears on display. 5 [/] <-- goes into Continuous operation mode with 'divide' operation, constant number is 5, 'K' mark appears on display. Set number notation format of calculator back to normal, a 'Norm' will appear on display. Display all numbers in fixing and rounding number at specific digits. After tap this button, then you have to tap a number to set which digits for fixing and rounding off. Display all numbers in scientific notation. Display all numbers in engineering notation. In this mode, number format will always in 1e+3 order scientific notation because that is more frequently used by engineers. The unit for triangle functions. Tap [Deg], the display indicator will show 'Deg' to indicate the unit for triangle is degree, all triangle function will work in degree for calculation. Tap [Rad], the display indicator will show 'Rad' to indicate the unit for triangle is rad, all triangle function will work in rad for calculation. Set normal notation format of calculator back to normal, a 'Norm' will appear on display. Calculate the square root at the first number on top of the stack. Calculate the square at the first number on top of the stack. Calculate exponentiation result of x^y. The second number on top of the stack is base x, the first number on top of the stack is exponent y. Calculate the y-th of root of x. The second number on top of the stack is base, the 1st number on top of the stack is y-th. The y can be any real number. Calculate (32 + 5^0.5)^(1/5) / (41 + 2^(1/3)) + 1.764^5.25 = ? Calculate sine value by first number on top of the stack. The unit is controlled by [Deg]/[Rad] button. If current mode is "Degree", sine value is calculated by degree angle unit, if it's "Rad", sine value is calculated by Rad angle unit. Calculate cosine value by first number on top of the stack. The unit is controlled by [Deg]/[Rad] button. Calculate tangent value by first number on top of the stack. The unit is controlled by [Deg]/[Rad] button. Calculate invert sine value by first number on top of the stack. The unit is controlled by [Deg]/[Rad] button. Calculate invert cosine value by first number on top of the stack. The unit is controlled by [Deg]/[Rad] button. Calculate invert tangent value by first number on top of the stack. The unit is controlled by [Deg]/[Rad] button. f(x) = 1.75 x^3 + 5.41 x^2 - 7.93 x + 42, calculate f(x=3.14) = ? At room temperature 25C, what's the average velocity (root mean square velocity) of hydrogen gas molecular (H2) ?